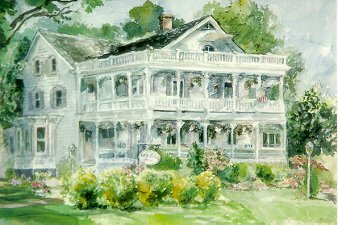 Built with a southern accent, triple-tiered porches, a comfortable parlor and a library allowing guests to relax and savor the romance of a bygone era. Sit fireside and enjoy friendly hospitality and full leisurely breakfasts amidst eclectic Victorian décor. Nine romantic guestrooms with cottage charm, private baths, queen beds, cable TV and A/C. (Some include fireplaces, whirlpools or an old-fashioned soaking tub). Let the comfort of the White Lilac Inn welcome you home at the end of your day.